A Great traditional Promotion for Synchro lovers from GERnetic International, buy a Synchro 50ml and receive one of the following at a discounted rate sets include ,30ml Immuno, Vasco,30ml Cytobi 30ml and Myo/Myoso 30ml , In a wonderfully imaginative White box, which is now ecologically manufactured makes a great gift to all your family and friends and is also a great saving. With the frantic pace of daily life, you skin can become dry, strained and taught and your complexion can become dull. It should be given all the active elements it needs. But it is important to choose the right, effective product for your skin. Discover the GERNETIC beauty product range on the following pages designed to ensure there is always a product to meet your individual needs. What woman, young or less young, does not dream of keeping her youthful skin or recapturing it? After years of research, GERNETIC Int. - specialists and consistent innovators in the area of skin care for over 30 years - have developed a line of three Timeless products for effective action against ageing of the skin, notably that of the face but also that of the hands, if necessary. These products prevent ageing and rejuvenate already aged skin, by stimulating cell proliferation, quenching free radicals, and nourishing cells deep down in the lower layer of the skin. Each of the three products can be used either on its own or in combination (depending on the specific case), to mitigate adverse factors such as mass-produced food, the stresses and pollution of modern city life. The fruit of the latest advances in biotechnology research, GERNETIC Int. Parfait products are impressively effective. These three products are going to surpass all your expectations and hopes. The curve of your bust depends on the tone of your skin and of the support, muscles. The breast is in fact supported by a "natural brassiere" or cutaneous girdle which determines its height and firmness. The elasticity of this girdle, constantly subjected to the trials of pregnancies, weight losses and natural ageing, must therefore be maintained. To keep the aesthetics and beauty of your bust, you must start looking after it early. Maintaining a beautiful body and regaining the curves and firmness of a toned body requires a healthy life style. In the majority of cases the restructuring of your figure means dealing with various causes that have to be identified, taking account of individual needs. The GERNETIC body range treats the different effects with various products perfectly adapted to each individual need to help you rediscover a younger and slimmer figure. GERnetic Spa Products are truly remarkable and achieve excellent result, the Marine exfoliating is one of our most popular products. If you would like a brochure please don't hesitate to contact us. An Amazing Offer From GERnétic International, purchase any one of this presentation sets and recivie the Concentrated Repairer Free plus a host of samlpes of the other Parfait products. These are little taster packs of facial product samples dealing with specific problems. If you are looking to test products for a specific condition, this could be a good way of trying before buying. Please remember that these are sample packs containing 2ml samples, usage instructions and other information and they should last a couple of days. Maintaining a beautiful body and regaining the curves and firmness of a toned body requires a healthy life style. In the majority of cases the restructuring of your figure means dealing with various causes that have to be identified, taking account of individual needs. GERnetic have launched the perfect starter pack of the body range of products, each kit contains all the products that you need to get going and help achieve the body you want. GERnetic have launched the the perfect starter pack of the body range of products, each kit contains all the products that you need to get going and help achieve the body you want. Manno is the perfect cream to keep your hands soft and flawless. Manno is nutritive, rejuventating and reduces pigmentation spots so your hands won't give your age away. It is customarily said that sunshine is good for us. While the sun is essential for the proper balance of our health, paradoxically it can become our worst enemy, especially in case of prolonged exposure or inadequate protection. The sun's rays in such circumstances can produce dramatic consequences. Of all the ultra-violet rays emitted by the sun, the UVC's are the most dangerous for humans. They are, however, normally filtered out 100% by the ozone layer. The UVB's, only 30% of which are filtered out by the ozone layer, are responsible for the majority of skin problems (burns, cancer, etc.). As for the UVA's, they are not filtered out at all by the ozone layer and are mainly responsible for ageing of the skin through the destruction of the basal cells. 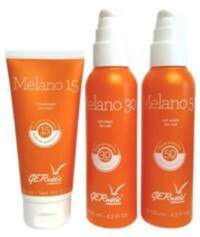 All that means you must use the most effective protection with top-quality sun tan products. The perfect introduction to the GERnetic Range of facial products or just a perfect travel pack to take on holiday with you so you can carry on using your favorites products. Excellent value for money. You cannot stay healthy if you do not get enough vitamins, trace elements (minerals) and amino acids; the body needs to be provided with all these in the diet every day if it is to continue functioning properly. Unfortunately, the modern diet - which is largely dictated by the food processing industry - is providing less and less of these nutrients. Therefore, supplementation of the diet is crucial. The extensive SKIN Whitening range from GERéntic will live up to all your expectations, whether you want to lighten your skin for a clearer, brighter complexion, or simply to eliminate unsightly dark patches on fragile areas directly exposed to the light. Nowadays, face care for MEN is in greater demand. Each year the average age is higher; it is therefore advisable to take care of your skin in order to look younger for longer. Having a well-moisturized, well cared and less wrinkled complexion is an additional asset to the personal and professional life. You will really appreciate these 4 exceptional products, especially developed for men skin. 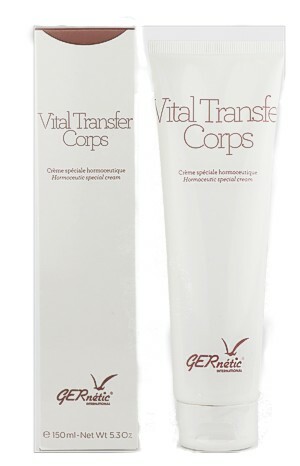 The Gernétic Laboratories have created a line of skin care products especially for Men. Feeling good is not exclusively reserved for women anymore. Taking care of your body begins with proper facial care. I am sure it is every woman's dream to have and maintain a beautiful bust. Statistically over 70% of women all over the world are dissatisfied with their bust from around the age of 20. However, help is now at hand thanks to modern research and serious laboratory work perfected at the GERnétic laboratories in France. M Laporte, scientist, gerontologist and founder of GERnetic, and his team worked on this formula for 7 years and it has been used in the UK since 1983 with great success. It is widely known that when a woman has a personal problem it affects her bust. He says that the majority of bust problems stem from a woman's lifestyle, be it a nutrition or hormone imbalance, stress or poor general health. By introducing specific nutrients through the skin (known as percutaneous absorption) this can re-balance the endocrine system and consequently help improve the bust. At the Marguerite Thorpe Health & Beauty Centre we achieve amazing results, managed easily and inexpensively by MACRO 2000 alongside Seino and Endo. We have also found that when used in conjunction with acne or cellulite treatments a quicker and lasting result is achieved. Similarly, women with PMT and menopausal problems are finding relief by using MACRO 2000 two weeks before their period. The products which have been most positively reviewed by our customers.